Attachment of some Mindtree shares owned by V G Siddhartha and his holding company, Coffee Day Enterprises, by the income tax (I-T) department could potentially delay his stake sale plans in the IT firm. Coffee Day has clarified that it would take required actions to release these shares in the next few days. In a filing, Coffee Day has said that no undisputed tax liability currently exists neither for the promoter nor for the company. However, corporate governance experts are of the opinion that buyers will take a cautious approach before the purchase of attached shares and may ask for indemnity clause to cover the risks arising from any future liabilities. 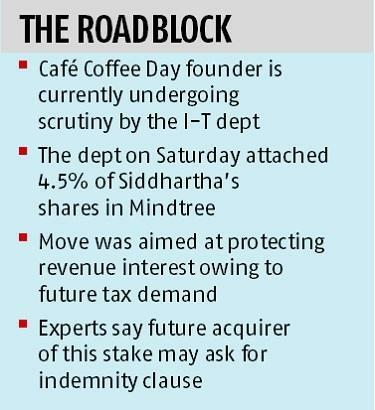 The department on Saturday imposed restrictions on transfer of 4.5 per cent stake held by Siddhartha and Coffee Day in Mindtree for a period of six months, citing possible future tax demands on him. A total of 7.49 million shares worth around Rs 665 crore faced this prohibitory order for the next six months starting January 25, 2019. “For Siddhartha to sell his entire 21 per cent (stake in Mindtree), any buyer will need that 4.5 per cent to be released because nobody will buy those attached shares,” said Shriram Subramanian, founder and managing director of domestic proxy advisory firm InGovern Research Services. “Also, there could be an indemnity clause (for risks arising out of this event) in case the I-T department or for that matter, anybody comes after that stake. Siddhartha may have to indemnify the buyer.” An indemnity clause becomes the part of a contract to prevent loss or compensate for it which may arise due to some specific events. This clause, in a way, transfers the risks from one party to another for future liabilities. Post the provisional attachment of these shares by the I-T department, Siddhartha is left with around 16.5 per cent stake, which are free of any encumbrance to offload. At a time when the founders of Mindtree are unwilling to shed their 13.32 per cent stake in the company, analysts said this could create a roadblock in the stake sale plans of Siddhartha. “Siddhartha may offer mortgage of similar amount that has been attached by the I-T department to a prospective buyer or can go for an appeal against the prohibition. In both the cases, he has to convince the buyer against any future liabilities, which may delay the process,” said a Bengaluru-based tax expert on conditions of anonymity. In the present case, Siddhartha and Coffee Day Enterprises have received notices under section 281B of the Income Tax Act, which empowers the assessing officer to provisionally attach any property of the assessee in the interest of protecting revenue arising from future tax obligations. However, such attachment could be revoked if the assessee furnishes a bank guarantee similar to the fair market value of the property attached subject to satisfaction of the assessing officer. Currently, Siddhartha is in talks with various private equity investors and technology firms to sell his 21 per cent in Mindtree, triggering concerns of management change or a hostile takeover as founders are not willing to exit the company. An acquisition of the founders’ stakes —currently at 13.32 per cent — assumes significance as the acquirer needs to hold more than 25 per cent to have board representation and to reach the trigger point for an open offer. In September 2017, the I-T department had conducted raids on the premises of the Café Coffee Day during which documents showing Rs 650 crore of concealed income were reportedly seized.